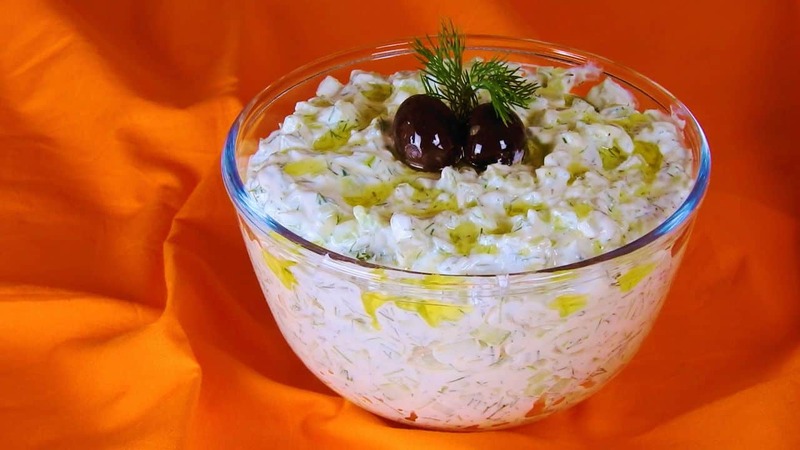 Tzatziki is a cool dip made with Greek strained yogurt, cucumber, olive oil, vinegar and garlic. It can be flavoured with herbs like dill or mint, which eliminate the strong aftertaste of garlic. It’s usually served with grilled meat, pita bread and fried potatoes but can perfectly match several cooked dishes, especially those with stuffed vegetables! Keep it covered in the refrigerator for up to one week and always serve cold. In the bowl with the yogurt add the olive oil, the apple cider vinegar, salt and dill. Crush the garlic cloves and mix them in the yogurt. Peel the cucumbers & cut them in small cubes. Add them to the mixture & stir until completely coated.